Ultimately, it's a great love story. It also shows Mel's love of torture scenes. "From the opening track, the discerning listener will understand that Horner is trying to produce a romantic, melancholy, and almost mystical atmosphere. The strings intertwine to create a sense that this legendary story of honor and freedom is being lifted out of an ancient mist. Then the mystic drone of the bagpipe is heard, and it is at this point that anyone with a true soul begins to break down. It is very rare that music can really touch the soul; it is even rarer for a soundtrack to do so. For all its greatness, a John Williams score is generally too boisterous to pierce to the heart. But Horner knows not only how to excite the senses with the drumbeats and battle-horns of war, but also how to arouse the long-forgotten desire to live a legend. 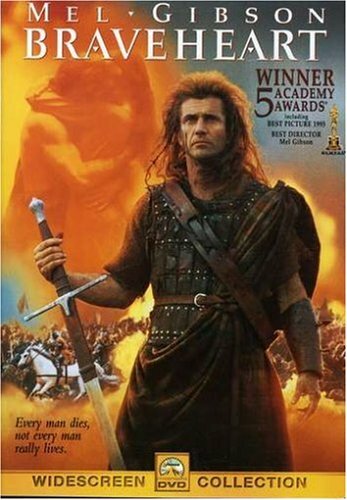 In the end, it is very hard to resist the desire to don a kilt and rush, sword drawn, at some modern-day tyrant."